When I asked Raquel Troyce, a native of Guadalajara who lived most of her adult life in Mexico City, if she knew anything about smothered burritos, she thought I was talking about some poor little donkeys that drowned. She was familiar with regular burritos (a flour tortilla folded around chicken, beef or beans), but had never heard of “smoth­ered” ones. 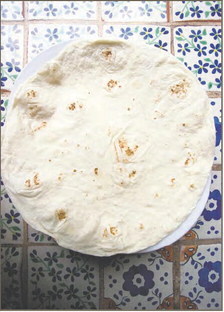 Regular burritos are mostly popular in the northern part of Mexico and it is said they originated in Ciudad Juarez, in the state of Chihuahua. As for the “smothered” kind, they are an American creation. Maybe even a New Mexican one. Orlando’s New Mexico Café, at 1114 Don Juan Valdez Lane in El Prado, is known for the quality of its food. It offers four kinds of smothered burritos: beef, chicken, vegetar­ian and shrimp. They are covered with chile (red, green or caribe), topped with jack and cheddar cheese. Orlando’s walls are decorated with ris­tras, paintings by Barbara Brock and Berlin Padilla, and the numerous awards that the restaurant has gotten since it opened in 1996. A large, wood-carved image of San Pascual Bailòn, (patron saint of cooks) presides over the kitchen. There are also other santos that local artists have brought here to display. Roberto Zabala, a young man from Guanajuato, Mexico, is one of five cooks currently employed by Orlando’s. He has pre­pared more than two dozen smothered burritos on the day of our visit. Orlando himself came up with the green chile recipe. His grandmother, Delfina Archuleta, invented the one they use to make vegetarian red chile. Orlando started his business selling handheld burritos (the regular kind, smaller than smothered ones and with no chile on top) from a cart in Cabot Plaza. When he opened the restaurant, he added smothered burritos, enchiladas, chile rellenos and the other delicious items now listed on the menu. As for what makes a good smothered burrito, having the right texture for the tortilla is imperative. “You have to warm it up before,” said Vigil. “Then, you put cheese, onion, beans, and cooked chicken, beef or shrimp inside it. 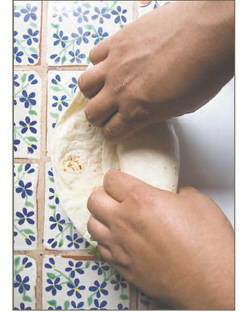 Roll it up nicely and add a little bit of whatever chile you want to use, and cheese on top. Put it on the salamander broiler briefly and let the cheese melt. The burrito must also be wrapped up properly. I took Raquel to Orlando’s and showed her the menu. She chose the vegetarian smothered burrito, tasted it and smiled.